My article below appeared in the August issue of Hill Country Happenings. Click here for more articles and information about happenings in the Texas Hill Country. July and August are truly the dog days of summer. According to my Yahoo search, the phrase comes from “the Dog Star, Sirius, which is part of the constellation Canis Major. Each summer between July and August the constellation appears in the northern hemisphere during what is usually the hottest time of the season.” What better time to attack the temperatures than to delve into the sport of swimming. Cool, refreshing and fun — especially with one’s canines! The day we booked our reservations, the temperatures had dropped from over a hundred to a pleasant eighty-two degrees. 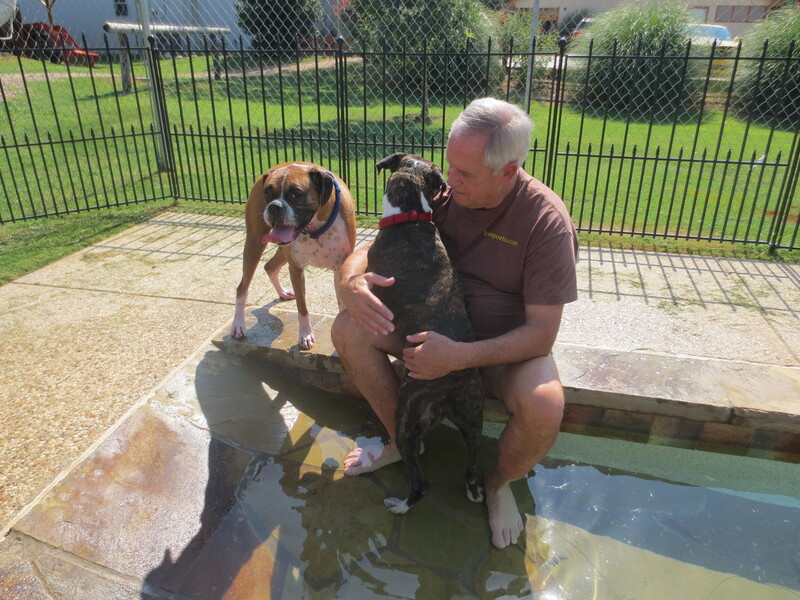 Roxie and Rex felt the excitement in the air as we loaded the car with towels, water shoes, toys and finally, them. The dogs knew something was happening other than the usual “Ride in the Car.” As we bumped down the dusty dirt road at the American Pet Spa and Resort, interesting sights and smells were being experienced by our Boxers. Confusion prevailed in the back seat as the dogs bustled from window to window. So much to see! We passed by a horse rescue corral, a swimming pool, an area of Old West style buildings, parks, and a pond with geese. Upon leaving the car, Rex found himself nose to nose with a wooden dog statue. He sniffed and pawed at it. No response. With a look saying, “Quit wasting our time,” mature Roxie disowned Rex and went into the building. If I don’t move, the water won’t find me! After checking in, we were escorted to a fenced-in pool area which also contained a glider with a canopy top, a pile of towels and a canvas bag full of toys. So much for coming prepared; blame the Girl Scout in me. The pool had a gradual slope at one end to wade in while the “deep-end” was a comfortable three to four feet. Rick and I jumped in! We splashed around and looked out of the pool. Both dogs were looking at us as if to say, “Uh… that’s water…we’ll get wet…no thank you…” For the first five minutes, not even a rubber ducky enticed them. I was thinking, “Gee, only twenty-five more paid minutes!” Rick finally picked up Roxie and gently set her in the shallow end. She stood there motionless, like the statue out front. Then he did the same with Rex and with the same reaction. 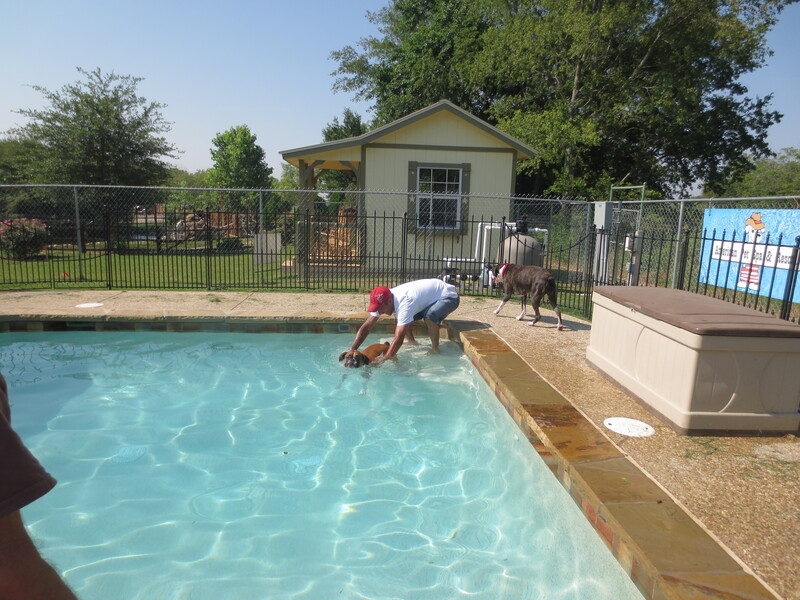 With the assistance of the pool guide, Tommy, we splashed around and tried to make the dogs enjoy the boredom of standing. That “fun” lasted a whole five minutes. disappointment must have been evident. The next thing I knew, Rex was at the “deep” end and airborne into the pool compliments of Tommy. As Rex hit the water, he immediately started into a fast doggie paddle towards us. “Come on Rex!! Come this way!” we coached. Soon he was at the shallow end letting out a huge spray of water as he shook. No sense in messing up a towel. 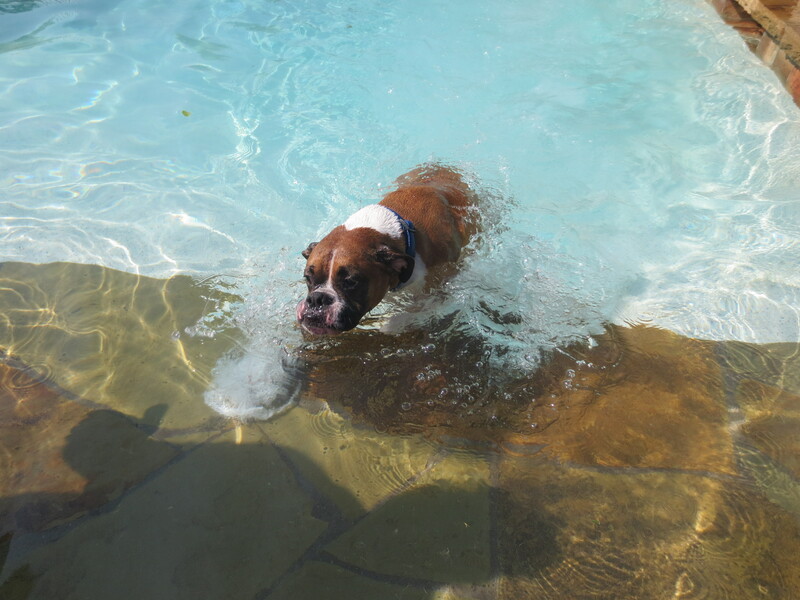 We soon discovered Rex had quite a command of his doggie paddle each time he was coaxed in. Not so lovely was his belly flop getting there! 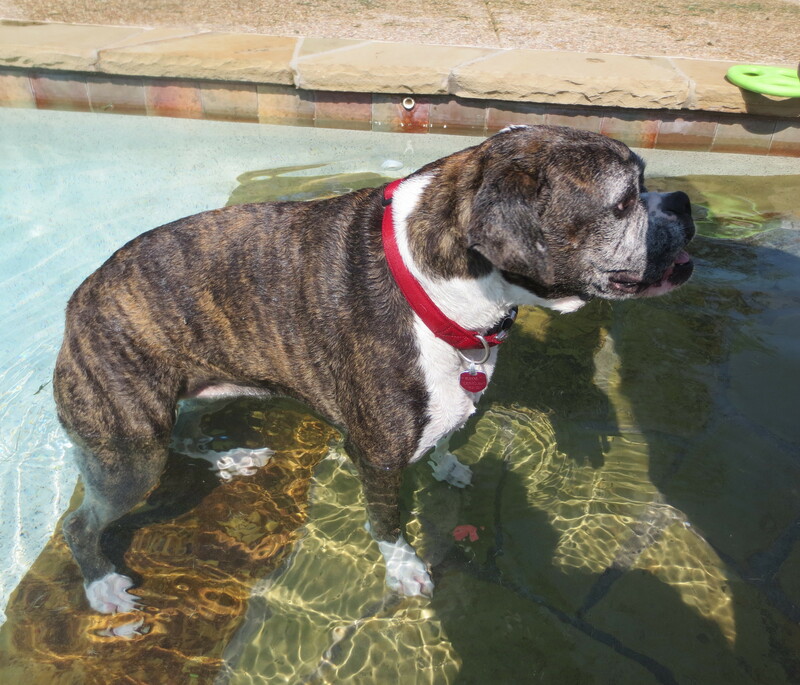 Meanwhile, Roxie did not want any part of the “experience” leaving the rubber ducky chasing to Rex. She would run back and forth along the edge, but would clamp down her paws in the pavement when Tommy tried to get her in the deep end. Rick finally got enticed her into the shallow end where she was just content standing in the refreshing water and drinking it! 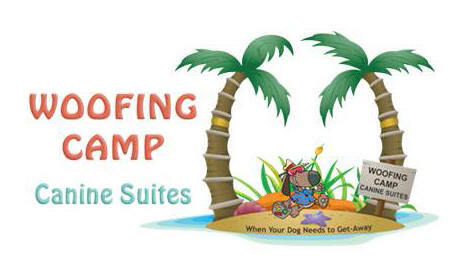 After all, it’s the dog days of summer – what better place to be for a dog. Check out Lotta Sports Facebook page for two fun videos of this! I think I’m trying out for the Olympics!